STACY BROWN INTERVIEW ABOUT JERMAINE JACKSON'S BOOK "LEGACY: SURVIVING THE BEST AND THE WORST"
DONNY DEUTSCH: Welcome to The Big Idea. I'm Donny Deutsch. Tonight, shocking new revelations about Michael Jackson and his family and questions about whether Michael's brother, Jermaine, is lying about a tell-all book proposal he was reportedly shopping around. Last night, Jermaine appeared on "Larry King" to deny he ever tried to sell a tell-all book about his brother. But new information out today suggests that Jermaine might have been lying. The Big Idea has obtained a copy of Jermaine's very own book proposal, and what it says contradicts what he said on "Larry King" last night. Here's what the book proposal reportedly says, that Michael Jackson bought his children from a sperm bank and didn't father them like he claims, that Michael hates Jewish people because Steven Spielberg stole the idea of Dreamworks Studios from him, that Michael was a drug addict, and that the Jackson family thought Michael might be guilty of molesting children. of lies about Michael Jackson. But who's telling the truth? Joining me now are the two people Jermaine Jackson says are lying on the phone now, from Scranton, Pennsylvania, Stacy Brown, who says he's going to sue Jermaine Jackson for slander, and in Los Angeles, a columnist who broke the story for the New York Daily News, Michelle Caruso. Stacy wrote an earlier book about Jackson called "The Man Behind the Mask." Also in LA, Jackson family attorney Brian Oxman. And with me here in the studio is investigative reporter Diane Dimond, who also wrote a book about Michael Jackson called "Be Careful Who You Love." Diane, let me start with you. Set this all up for me, OK? DEUTSCH: How do we know this? How do we know this? DIMOND: Well, first of all, it was testified to in court during the criminal trial. DIMOND: That--that's first of all. And Michelle Caruso's great reporting on it. And--and various sources have said that that's what he wanted to do. He needed money. Then comes the arrest of his brother in November 2003, and Stacy Brown, being the good journalist that he is, says to Jermaine, you know, you've got to talk about this in any book, we need to fix up this book proposal. So now they're on book proposal number two, which I have in my hand, which you have a copy of, and this is the dynamite book proposal where he says he will tell all about how is family is worried about Jackson's sexual activities with children for two decades, he's a drug addict, etc. Now, Jermaine says he never wrote this proposal; however, Donny, he's left a trail that says otherwise. In early December 2003, he came to New York, met with an agent. He met with three publishers. Well, they set up three meetings with three publishers, Hyperion, Harper Collins, and St. Martin's Press. DEUTSCH: And there's a paper trail with that. DIMOND: There's a paper trail. There's a paper trail, Jermaine! DEUTSCH: Michelle, let me go to you. You broke the story. Tell me the proof you have that--that Stacy's side of the story is true and that Jermaine Jackson is lying about having nothing to do with this book. MICHELLE CARUSO: Well, the proof that I have is a copy of the proposal, which I have every reason to believe and am confident is the same proposal that Jermaine Jackson shopped to the three publishers that Diane just mentioned. There may be various drafts of it, but I'm confident that the one that I reported on is the one that he shopped to publishers in late November, early December 2003. DEUTSCH: Stacy, I'm going to go to you and I'm going to give Mr. Oxman--Mr. Oxman a chance to--to respond. Tell me what proof, because we have this book proposal, but once again, I don't see Jermaine Jackson's signature on it. Tell me the proof that you have, sir, that Jermaine Jackson is behind this book proposal and these allegations. STACEY BROWN: Well, you don't see my signature on it either, but the fact is I would not have written anything without the--without the express consent of Jermaine Jackson. And, in fact, you will-- you will see more than just paper in the coming days, you will hear it on tape in the coming days. So Jermaine should be very careful about what he says. BROWN: They corroborate everything that Michelle Caruso has reported. And as I told Michelle when she first called me, I didn't want to be bothered with anything named Jackson in the first place, but there was a story, and she wanted my comment and I gave her my comment. Michelle did a great job in reporting it. DEUTSCH: Michelle, tell me the quotes from the proposal that Stacy says he has audiotapes of. MICHELLE CARUSO: Well, I don't know anything about the audiotapes, that's not my department. But the quotes in the proposal that I'm sure have captured the most attention is Jermaine Jackson speaking about Michael's drug and alcohol abuse. There's a litany of drugs that he names that his brother has used, codeine, morphine, Vicodin, etc., etc. He talks about the family being uncomfortable for a number of years with--with Michael's dealings with young boys. And in one quote he says, after laying out all the drugs that Michael has done, he says, "Does he really know what he does with these kids?" And--and he says, you know, things like, "I--I can't tell you--I'm not here to tell you that my brother's innocent. I'm not sure that he is." You know, things of this nature. And--and I believe that Stacy has corroborated that--that the book proposal that I have does contain these quotes and that he apparently has them on tape, which I wasn't aware of. DEUTSCH: Let me read those quotes. On Michael's innocence vis-a-vis child molestation, and this is reading from the book proposal, and this is from Jermaine. "I don't want to tell you my brother's innocent, I'm not certain that he is." BROWN: They are currently in the possession and being reviewed by Mel Sachs, who--who--he and I have talked and we will be launching a very aggressive slander suit against Jermaine Jackson. On Michaels' drug use, and I'm quoting from the book proposal that is allegedly involved with--coming from Jermaine Jackson, "Michael's drug use, I'm afraid, is going to be part of his legacy, and there's nothing we can do any longer to hide it. The Demerol, the Vicodin, Percoset, the codeine, the cocaine, the Jack Daniel's, the wine, does he really know what he does with these kids?" On his children, once again, a quote from the alleged book proposal from Jermaine Jackson with Stacy Brown, "He paid this woman who nobody would ever look at twice several million dollars. My brother purchased children. It is like a sanctioned black market. He's very powerful. He picked the sperm donor by using information provided by a sperm bank. Now, who can do that? Michael Jackson, that's who, my brother." On his father, Joseph's abuse, "Joseph did some disgusted--disgusting things to LaToya and Rebbie especially. If it weren't for my mother's loyalty to him, he'd probably be in prison for what he did to our sisters." And finally on why he hates Jews, once again, this is from the alleged book proposal that Jermaine Jackson was behind, "It was my little brother, he conceived the whole idea behind Dreamworks. The logo is still proudly the official logo of Neverland. Unfortunately, Steven Spielberg, Jeffrey Katzenberg, David Geffen all stole the idea from him. That's one reason why Michael hates Jewish people so much." DEUTSCH: Br--I'd like Brian to respond. Brian, you're a family attorney for the Jacksons, I'd love for you to respond to these allegations. BRIAN OXMAN: Donny, every day during that trial, I got calls from a member of the Jackson family. In particular, it was about once a week that Jermaine would call me. 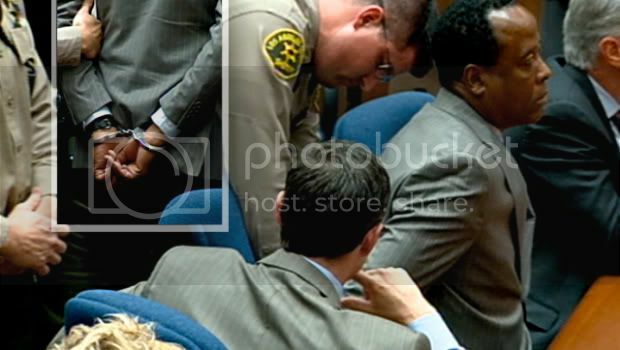 He was infuriated at the prosecution, he thought that Michael was innocent, he protested continuously. So when I see this book proposal coming out, and I see that Stacy Brown is behind it, these aren't Jermaine's words, these are Stacy Brown's creation and fiction and really imagination. BROWN: Well, Brian, it's--it's amazing that you would take that position when you came to me at Neverland and said to me, and I quote, that 'If I were paid any money that the Jacksons owed me, I would never have to work again' You know, Brian, you need to watch what you say, because again, this stuff that Jermaine said is on tape. OXMAN: Stacy, you know, there's another one which was never said, never said any such thing to you. BROWN: Yeah, of course not. I don't expect you to own up to that. OXMAN: The family's business is with you--won't own up to it because it didn't happen. DEUTSCH: ...that he has these allegations on audiotape? OXMAN: Well, we'll have to listen to those audiotapes. BROWN: And I'm sure Brian will--Jermaine, because as Diane pointed out, he has no money. I used to lend Jermaine money, money that I never got back. OXMAN: You know, Donny, I find it offensive that someone goes to someone to say, `Let's write a book together,' and then the book proposal gets created out of fiction. And next thing we know, the co-author is disclosing the tapes. BROWN: Well, who went to who, Brian--Brian, who went to who? CARUSO: But you always make tapes if you're going to do a book proposal. OXMAN: It was Stacy Brown who came to Jermaine. BROWN: (Unintelligible)...came to me to write a book. OXMAN: This is Stacy Brown who came to Jermaine. BROWN: Oh, give me a break. DEUTSCH: Stacy, you--Jermaine came to you? BROWN: Give me a break. First of--first of all--first of all, everything that they've ever asked me to do, I have done. I have written press statements for them, press releases for them, in particular Jermaine Jackson. I never approached anybody to write a book. I wrote--I wrote a book before with Stevie Wonder's mother, she approached me through--through a friend of mine who is her grandson. I've never asked anybody, `Let me write a book for you.' Jermaine Jackson approached me. OXMAN: The problem here is that it's not true. BROWN: ...that they were--they were created in not Jermaine's voice, that's going to be the next thing? OXMAN: Every time I turn around, there's tapes of this family, tapes of Michael Jackson, tapes of LaToya. BROWN: And every time I turn around, this family is shooting themselves in the foot. OXMAN: And you know something? BROWN: They are high maintenance, and that's what I told Michelle, that's why I'm extremely happy not to be associated with them anymore. OXMAN: Who's the troublemaker here? DIMOND: You know, Donny, you have got information here that nobody's ever gotten out. This is--you know, when I do a book proposal, I put things on tape so I remember, and I write them down correctly. I had no idea that Stacy Brown might have actual tapes of Jermaine Jackson saying the things that are in this proposal. We're watching the walls of Jericho come falling down around the Jackson family. DEUTSCH: Michelle, are you surprised to hear there are audiotapes here? that there are audiotapes off this program right now, but I'm not surprised that an author would make tapes. CARUSO: I think denying it is a very typical response to this kind of revelation. decide we--we shouldn't be friends anymore? DEUTSCH: Why did Jermaine have a change of heart? If what you're saying is true and you do have tapes and he was behind this book proposal and these allegations, why did he have a change of heart? BROWN: Well, because Mike was his meal ticket. DIMOND: Well, Michael Jackson found out about it and had a fit. BROWN And went ballistic. Bob Jones can tell you that--that much about it. That's what he knows about it because Bob was still working for Michael at the time, and he remembers the office being in chaos. MJJ productions was going nuts. BROWN: And we got a call from Brian Wolfe, a real attorney of Michael Jackson's. And Brian Wolfe had the audacity to tell an attorney which I retained for myself and for Jermaine, at Jermaine's request, to have Jermaine and myself write a letter to every publisher in the US and the UK saying that we would not go forward with our book. DEUTSCH: You also--go back to the--the publisher--the book agent, the literary agent that you spoke to directly that met with Jermaine Jackson and Stacey. DEUTSCH: Who was at the lunch? DIMOND: So then they shopped it to these three places, more of a paper trail. They left proposals behind, more of a paper trail. And not the proposal is come out in toto in the paper today. DEUTSCH: So why wasn't anybody--they couldn't get anybody to publish this? DIMOND: Well, because, the one man from Hyperion said, `Are you sure, Jermaine, if we do this that we're not going to get sued by your brother?' This was the big concern, and that's why it wasn't picked up. Jermaine made a big deal of it last night on "Larry King Live" saying, `Well, if I had this great big blockbuster, why didn't anybody print it?' Because very publisher they went to was so afraid of litigation. BROWN: And you've got to remember, Jermaine went outside of the agent with the proposal as well. The agent wasn't the only one shopping it. Jermaine had a woman named LaWanda Lane shopping it was well and sending e-mails to publishers. DEUTSCH: Stacy, I want to show a clip of Jermaine on "Larry King," and then, Stacey, I want to get your reaction. JERMAINE: I was pissed off, very upset, very upset, Larry, because you know where my heart has been since day one. Michael's been a thousand percent innocent. I have spoke from my heart, I have spoken the truth. And for me to--I mean, this is not good for me. It's not good for the family. No, it's all false. It's lies, lies, deliberate lies. DEUTSCH: Stacy, lies, lies, deliberate lies. BROWN: Well, if they're deliberate lies, then he deliberately told them to me two, three years ago, and he certainly knows that Michael threatened to kick him out of Havenhurst. He threa--he definitely knows that Michael had his attorney, his real attorney, Brian Wolfe, attack us. Evvy Tavasci, Michael's assistant, called Jermaine, called me, called Katherine and found--the conversation--a three-way conversation I had between Evvy, Katherine. Jackson and myself was very disturbing in how Evvy Tavasci, as an employee of Michael Jackson, spoke very disparagingly of Katherine Jackson. DEUTSCH: Michelle, there were some other allegations, specific allegations in the book proposal about Michael and his nephews. Can you talk to us about that? And also, this has been corroborated by other family members. Look what LaToya said. And--and then Jermaine backs it up. And then you gotta--you gotta think about this: I have been around when some of the things--so many things that they've said to me, I've kept it, as they say, in the vault. I have not--I have not disclosed stuff. Jermaine wants to attack me, he better be careful. I mean, he realized Stacey Brown knows a whole lot more than what that book proposal says. DEUTSCH: Stacy, what have you--have you seen, over the years, inappropriate behavior that you haven't talked about? Or is there anything that you'd like to talk about now? believe that he is not a good guy. BROWN: You forget, Brian, I was there, too, right there with you. DEUTSCH: Diane, I want to get...(unintelligible). Jump in there. DIMOND: If Stacy made all this up, then how does he go to the business meeting that Jermaine says his father used to have with cronies in the hotel rooms after the Jackson 5 would perform. BROWN: I certainly wasn't there. OXMAN: Because I don't think Jermaine saw this. DIMOND: And then all the boys would go to bed, but little Michael would be in on the meeting. And he said, `My brothers and I always felt bad for Michael because days after this meeting there hints of something inappropriate going on.' Michael would not be the same. He'd be sick for days. If Stacey Brown were there to make it up--I'm not here to defend Stacy Brown, but it doesn't logically make sense to me, if he had tapes of Jermaine Jackson saying the things that are in this proposal, he could have gotten hundreds of thousands of dollars for that tape from any tabloid in the UK. BROWN: And--and it goes to my loyalty to them. And, you know, Brian, your loyalty is to be commended, but it sometimes, if you don't know what you're talking about, you shouldn't say anything at all. And, as a lawyer, you should know that. DEUTSCH: I want to show another clip from Jermaine last night on "Larry King." JERMAINE: There is no book about Michael, no negativity. I stand behind him a thousand percent, like I said since day one, and he's still that wonderful person that he's always been. LARRY KING: We spoke with ghostwriter Stacey Brown, who said there was a book proposal out there more than two years ago called "Legacy," and that it came to an end when Michael found out about it. JERMAINE: No, it did not come to an end when Michael found out about it. It came to end when someone like himself was putting out a whole other manuscript that wasn't telling the truth, going behind my back. And I say it again, Michael's people called him, and they told me they traced the e-mails back to him. BROWN: Jermaine knows that. We've sat--let me tell you something, Donny, we sat at Havenhurst for hours and hours and days and days. There are times that I've spent a week at Havenhurst, and Jermaine, middle of the night, if I wasn't there, he'd be on the phone, he'd be pouring out his guts, he'd be crying. We talked three hours. You know, he's got other issues like marrying and fathering children from his brother's ex, who has children. And we talked about things like that. He's got other issues, like $5 million in debt to the IRS, and we'd talk about things like that. But his main issue was always Michael. Look at his song "Word to the Bad." Now, Jermaine gave me two different explanations about that song. And that's the song where he talks about Michael changing his skin color and not being proud to be black and--and backstabbing his own family. Jermaine told me that the reason he wrote that song, LA Reid and Babyface Edmonds tricked him into writing it. And then on another occasion, he told me that the reason he did it, he was mad with Michael. So tell Jermaine to get his story straight. 3,000 situps a day, but you have another opinion of where he is right now. DIMOND: Yeah, I don't think Michael Jackson is in Bahrain as he told Larry King last night and that he'd been there to visit him. I don't believe either of those statements. I believe Michael Jackson is in London right now. Last I heard he was held up at the Dorchester Hotel. DEUTSCH: Based on what? What's your source of information? DIMOND: I--I have very, very good sources, very close to the family and other places. I also understand that all of his bodyguards have now quit. Michael Jackson is wandering around, I think, trying to figure out where--where to go next with the nanny of his children, a woman named Grace, and his three children. No bodyguards, not entourage, no makeup or hair people, not--nothing. Just him. DEUTSCH: Michelle, any updates from your--from your information, your sources of where Michael is? CARUSO: Well, I know he was in London not long ago because there was a story that moved on the wire about him being on a commercial flight with a bunch of British rugby fans. But I can't be sure where he is today. He does move about rather stealthily around the globe. So I'm not sure. DEUTSCH: Brian, if Stacey sues Jermaine based on slander, based on he has tapes of Jermaine actually saying these things after Jermaine went on "Larry King." OXMAN: Donny, is that it? Yes. DEUTSCH: Well, let--well, once again, I have to say, when he--if and when he comes out with these tapes and does sue Jermaine, what--I'd love your take on that, sir. OXMAN: Well, President Reagan use to quote a very famous detective, "Dirty Harry," who said, "Go ahead, make my day." And it seems to me that that's exactly what we're going to have here because I don't care what these tapes say, these tapes are under contract. These tapes are under contract with Stacey Brown and not to disclose them, that's number one. BROWN: The biggest spin doc in the world you've become, Brian. I expected more from you on that. OXMAN: I doubt very much--Stacey, I doubt very much whether these tapes support you at all. DIMOND: See you in court, I guess. DEUTSCH: Guys, this one is going to continue. We will follow it. Michelle Caruso, great job breaking the story. I want to thank Michelle Caruso, Stacey Brown, my good friend Diane Dimond, and Brian Oxman, thank you for joining us all.